I knew the price of the tool was going to be less than what I could pay myself to make the tool so I did decide to buy it. Valuing your time and knowing when to buy rather than make something is a skill in-and-of itself. 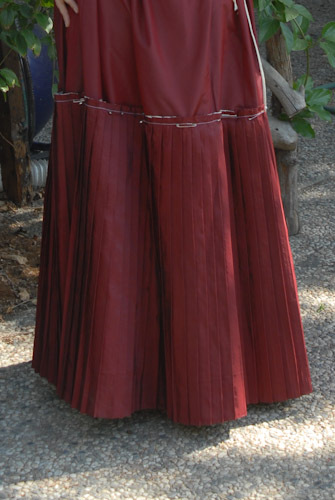 I always want to “make” but I even flirted with the idea of getting a company to pleat the skirt but the amount I needed so tiny that doing it in house was the best option. The bottom circumference was set and the bottom edge finished. 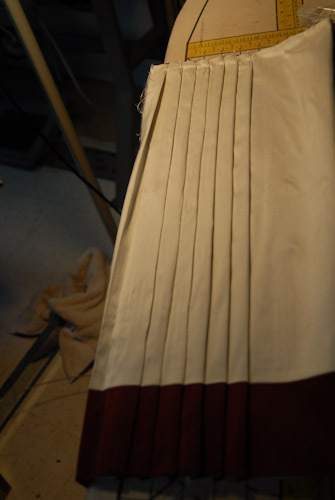 The final length of the skirt will be adjusted at the upper edge of the pleated ruffle. 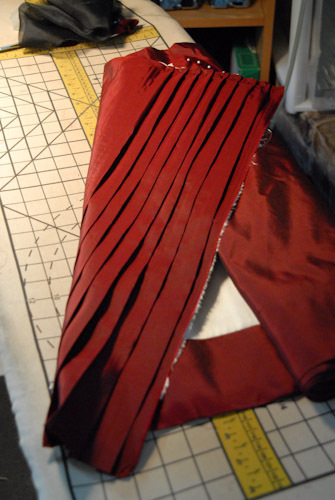 This way I can pre-set the pleats with a hem already built in. The pleater arrived very promptly though so with my new tool and instructions in hand I went to work. As I started using the pleater, I got to thinking, will this pre-made pleater really be able to handle two layers of fabric with a seamline? I hadn’t even thought of that. 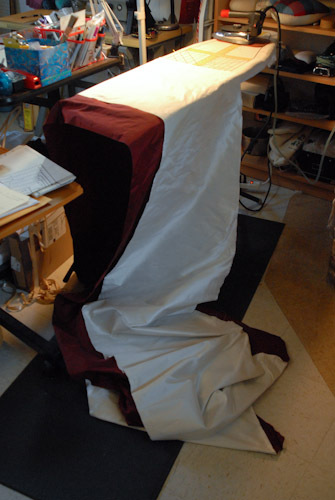 The instructions have recommendations for folding over your fabric fully to eliminate seamlines but there was no way I was going to put 22″ of red silk hidden inside the skirt. 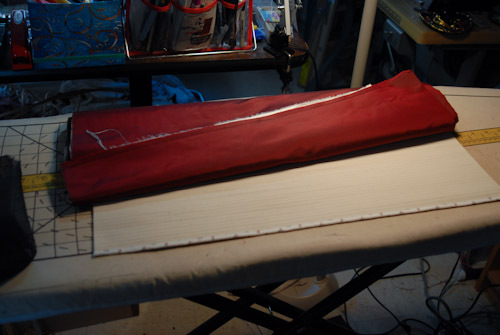 It was important to use another less expensive silk and maintain that yardage of the red for the gown itself. So I went ahead and tried with the already sewn seamline. My instinct was to do the pressing from the lining side but in the end I realized it had to be done from the front. No matter how careful I was when working with the two layers the underlayer would shift a touch. 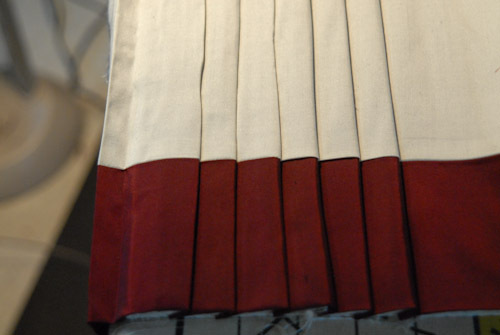 So I reversed my method and pleated the red upwards using a press cloth so the perfect pleat edges are pressed into the fashion fabric where I can see that they are perfectly lined up. 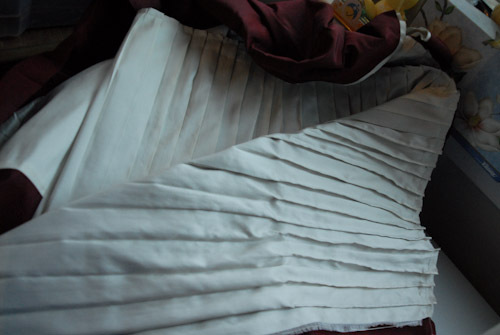 By the end of the row of pleating the lining pleats were almost identical to the fashion layer pleats. 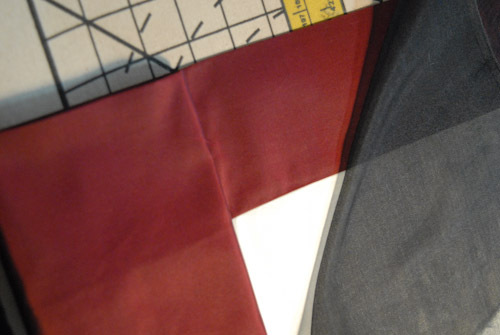 Practice really does make perfect and the perfect pleater was able to handle the two layers and even the seamline. I just had to make sure not to over-press the seamline or over force it into the pleater. I sat playing with it for a while myself and then had my mother-in-law and my roommate look at the process and mess around a bit with it as well. After my first two sets I mastered the pulling, tucking, and pressing. The silk was pressed with a linen cloth with white vinegar:water (1:9) solution. (Please always test your fabrics for running and/or staining before pressing with any liquids). The silk handled the treatment beautifully. While not permanent like you can get by partially melting polyester fabrics, it is holding a nice crisp pleat all the way down. I think the most important part is steaming the pleats with a well rung out press cloth and letting them fully fully dry. After dry, I removed them from the tool, pinned them down evenly and did one more dry press. While I liked the idea of stitching them into place it ended up looking disjointed and not fluid enough for the skirt so this idea was abandoned. Fantastic! I can not wait to see the final product! Great review as well, very helpful and informative. Pleating 101: Thanks for the tutorial! Truly a good time if done with the right attitude. Hey, I’m enjoying your blog! I dithered about buying a perfect pleater with my last Victorian dress but since I was making it in about 3 days flat there wasn’t time to order. Based on this I think I will go ahead and get one!